The Aadhaar case will be a look at the legality of the The Aadhaar (Targeted Delivery of Financial and other Subsidies, Benefits and Services) Act, 2016. Even as tensions continue to simmer at the Supreme Court following the press conference held by four senior judges over the allocation of cases by the CJI, the court constituted a Constitution Bench to hear certain important matters. Comprising CJI Dipak Misra, Justice AK Sikri, Justice AM Khanwilkar, Justice DY Chandrachud and Justice Ashok Bhushan, the Bench will take up matters ranging from Aadhaar to the decriminalisation of homosexuality on Wednesday. The Aadhaar case will be a look at the legality of the Aadhaar (Targeted Delivery of Financial and other Subsidies, Benefits and Services) Act which was enacted in 2016. In December 2017, the court had extended the deadline for mandatory linking of Aadhaar with various services and welfare schemes till 31 March, 2018. It had also modified its earlier order with regard to linking Aadhaar with mobile services and said the deadline of 6 February, 2018 for this purpose also stood extended till 31 March. The same judges who had heard the matter then will be hearing it on Wednesday. Soon after the deadline extension was reported, lawyer Prasanna S pointed out that the order failed to look at the inherent lawlessness by the state which had mandated Aadhaar for bank accounts despite the court's own earlier orders disallowing Aadhaar's use for anything other than voluntary use for six schemes. ...the union govt never having applied to the Court to modify its earlier orders. An interim order without good reasons for condoning such apparent lawlessness of the state is to say the least, disappointing. LiveLaw had reported that the judgment in Binoy Viswam vs Union of India will continue to prevail as far as the requirement of Aadhaar for PAN under the Income Tax Act is concerned. In August 2017, the Supreme Court in a unanimous 9:0 judgment had declared the Right to Privacy to be a Fundamental Right. It was hailed as a big victory for pro-privacy advocates who could now point to the Constitutional Bench judgment should the right ever be questioned. However, the judgment only established the theoretical Right to Privacy. It removed the earlier hurdles of the cases of MP Sharma and Kharak Singh which had held Right to Privacy not to be a Fundamental Right. However, the actual freedoms protected by the Right had to be enshrined into in separate judgments. As far Aadhaar is concerned, the judgment did not invalidate it in any way. However, it did give a boost to anti-Aadhaar arguments which rely on privacy as now the government can no longer say that there is no Right to Privacy. That being said, Soli Sorabjee while talking to The Economic Times said, "You cannot make a blanket and categorical statement that Aaadhaar will be banned or is unconstitutional. No Fundamental Right is absolute. It is always subject to reasonable restrictions." Thus even after recognising Right to Privacy as a Fundamental Right, the court could still save Aadhaar under a reasonable restriction. Meghnad S had told Firstpost that "Aadhaar might slip through the cracks because an arbitrary restriction like national security might be used. It's about a larger question of privacy right now." 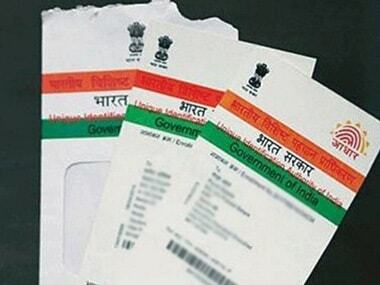 Finance Minister Arun Jaitley had said he was sure Aadhaar will stand the test of constitutionality. "The legislation has been passed and I'm sure it will stand the test of constitutionality. Even while upholding the idea of privacy as an important constitutional guarantee, the Supreme Court said that it is the question raised just now. (Violation of privacy) could be imposed by law but they have to be obviously reasonable," Jaitley had said. He had said that the Right to Privacy has illustrative restraints like national security and dissemination of social benefits and Aadhaar is being used for the latter. "As some of the illustrative restraints, not exhaustive, are in the larger interest of national security or for the purposes of dissemination of social benefits," he said. Writing for Firstpost, Kriti Trehan had argued that in principle, we are faced with issues of consent. In practice, we struggle with infrastructural deficiencies and an absence of safeguards and accountability. The large-scale centralisation of everything from personal identifiers to financial information, coupled with less than confidence-inspiring security systems to keep the data safe, is probably the greatest concern plaguing those who are sceptical of the Aadhaar process from a privacy perspective. A centralised database that amasses the personal information of the entire citizenry and links it across platforms and services has the potential of being used as a tool for Big Brother-esque policy implementation. Finally, Suhrith Parthasarathy wrote in The Hindu that the government will, no doubt, argue that Aadhaar can bring about many benefits. However any policy, howsoever poorly framed, will likely bring about certain gains. The question is ultimately one of proportionality and justice. Arguing that the government's aim is to create a seamless police state, which will chill our freedom and give the State rampant power he asks whether the Supreme Court will dare to stop this?